The Tamil Nadu Teachers Recruitment Board has declared TNTET 2017 Result. Candidates who had appeared Teacher Eligibility Test can check these latest updates. Authorities conducted the TET 2017 Exam on 27th & 30th April 2017. Aspirants are supposed to download Tamilnadu TET Results from official website at trb.tn.nic.in. Around, 241555 candidates appeared for the Tamilnadu Teacher Eligibility Test Paper-I Exam and 512260 for Paper-II. Recently Answer Key has released on May 22. Aspirants have verified their answers from online website of all sets. Now, it is the time to check whether your roll number is in the TN TRB TET Merit List 2017 or not. The Teachers Recruitment Board, Tamil Nadu has conducted the Teacher Eligibility Test. “After thorough scrutiny, a revised and final answer key has been arrived and based on that, OMR answer Sheet have been valued and provisional mark list of the Written examination of TNTET Paper-I (Class I-V) and Paper-II (Class VI-VIII) 2017 are published” said a statement accompanying the results. According to the Right to Education Act, National Council of Teacher Education (NCTE) conducts Teacher Eligibility Test (TET) state wise. TN TET is one of the essential tests to quality for the appointment of teacher in Tamil Nadu State. This academic year, the exam is conducted on April 29 & 30. Now, they have released TN TET 2017 Result. Aspirants have to check the TN Teacher Eligibility Test Cut Off Marks. The Paper I weightage marks are Plus two 15 marks, DTED (Diploma of Teacher Education) 25 marks, TNTET 60 Marks and for Paper II Plus Two 10 marks, DTED 15 marks, B.Ed 15 marks and TNTET 60 marks. Aspirants have to score more than or equal to cut Off. 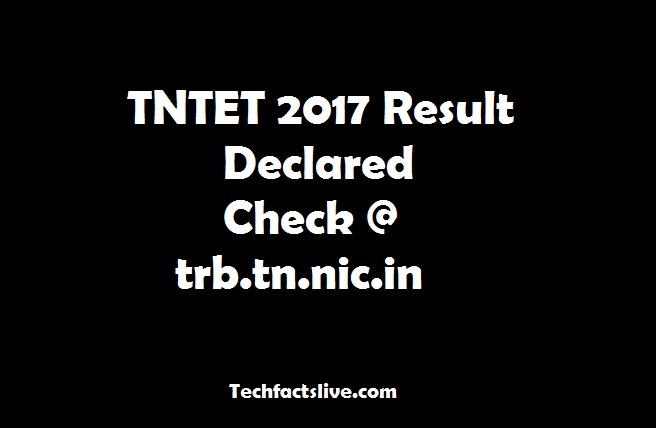 The active link of TNTET 2017 Result is available at the end of this article. Aspirants have to done the exam well TNTET Paper I is held for 150 marks and TNTET Paper 2 for 150 marks. Paper I exam is for Class I to V and Paper II exam is for Class VI to VIII. Download the TN TRB TET Merit List 2017 from online web portal at trb.tn.nic.in. The procedure to check results had given below. Therefore, more details regarding TNTET will update soon.